Assisi work uses a method known as voiding in which the background is filled in while the motif itself is left blank. Cross-stitch is used for the background and blackwork, i.e. Holbein stitch is then used to outline the motif and create the surrounding decorative scroll work. Traditionally, Assisi embroidery was rarely executed in cross-stitch, but most often in long-armed cross-stitch. 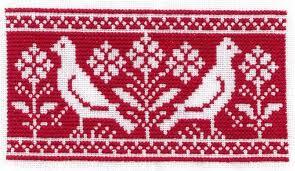 Examples employing other stitches are also known, such as cross-stitch, Italian cross-stitch and Algerian plait stitch. The colours of thread used were the traditional ones of red, blue, green or gold for the background, and black or brown for the outlines. Traditional motifs were largely heraldic, especially heraldic beasts, and typically featured symmetrically arranged pairs of animals and birds surrounded by ornate filigree borders. In the oldest pieces, the figures were drawn on the fabric free-hand, surrounded with Holbein stitch and the background was filled as well as possible. For more modern pieces the pattern was constructed carefully on paper, in much the same way as cross-stitch patterns are created. Today Assisi embroidery is nearly always done this way. Motifs were strongly influenced by traditional designs of bird or animal pairs surrounded by elaborate scroll work. These early articles were most often used for religious purposes e.g. altar cloths and chasubles. Assissi? Absolutely love Assissi. I can show you a before and after piece I’ve done. It is amazing. I did an Assissi design. The fabric really becomes the focal with this kind of stitching.